Want to learn more about what you see in our galleries? More than Meets the Eye: A Discovery Resource is an interactive tool designed to be used with one of the quilts in the exhibition, Piece Together: The Quilts of Mary Lee Bendolph. The guide can be enjoyed by all ages. You can also view a pdf via your mobile device in our galleries or download the pdf to create a personal copy. 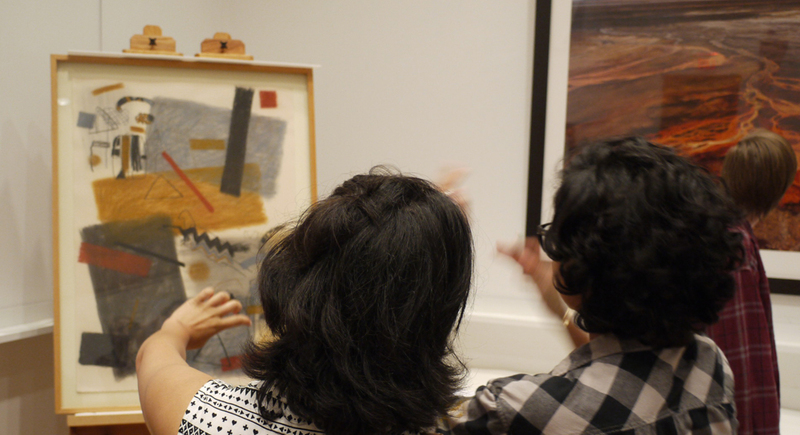 Our Self-Guided Highlights Tour will help you navigate the Museum and learn more about important works of art in the collection. A limited number of printed tour packets are available as gallery copies for use during your Museum visit. You can also view a pdf via your mobile device in our galleries or download the pdf to create a personal copy. MHCAM Journeys are self-guided digital tours that can be accessed via your mobile device in our galleries or enjoyed outside of the Museum. Two thematic tours are currently available: In the Details, which prompts visitors to discover how the smallest detail can change the way we see and understand a work of art; and Death, Love, and Resurrection, which examines the dialogues that exist between these themes, from Roman sculpture to contemporary American painting. These MHCAM Journeys were created by Naomi Romm (Hampshire College ’16), the summer 2016 Institute for Curatorial Practice Intern. Our Family Activity Book is designed to help young visitors explore significant works of art from across the centuries and around the world. We have chosen works that we hope will challenge you to look closely, share your thoughts and ideas with each other, and compare your impressions. Enjoy the galleries at your own pace!